Recent advances in technology bring the apparel, technology, and textile industries together to build new capabilities in fabric. Known by smart fabric, these new high-tech products interact with their user by tracking data about them through sensors. 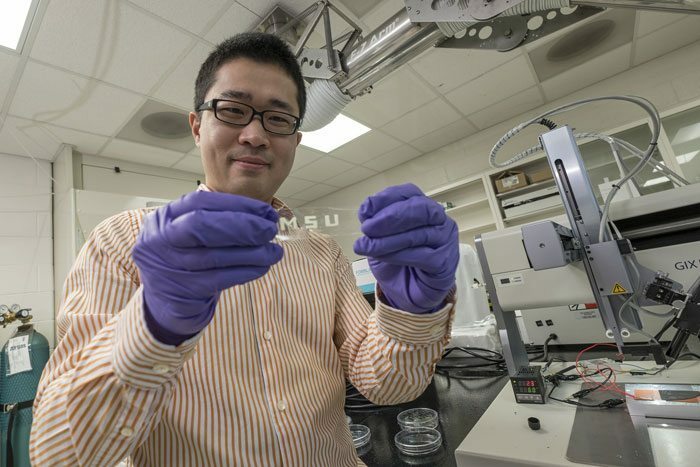 Likewise, scientists from Michigan State University have developed the first stretchable integrated circuit. The circuit is also known as stretchable smart fabric. This stretchable smart fabric can be stretched easily from mini-size to extra large. It is entirely made from an inkjet printer. According to scientists, it could increase the possibility of inexpensive mass production of smart fabric. Generally, a smart fabric is created by fabricating nanomaterials and organic compounds. The compounds next dissolved in a solution to produce different electronic inks. Through this electronic ink, scientists created an elastic material, the circuit, and the organic light-emitting diode, or OLED by running the ink through the printer. Generally, there are millions of pixels just underneath the screen of a smart tablet or a large display. But. scientists want to combine combining the circuit and OLED into a single pixel. Stretched easily from mini-size to extra large. Could use as rubber band-like wrist monitor that measures one’s heartbeat. Used as wallpaper that turns an entire wall into an electronic display.